Whole Wheat Stir-and-Pour Sandwich Bread. YES, it works! If you haven’t tried this Whole Wheat Stir-and-Pour Bread yet, I’m here to give you more reasons to make it. First, you make it exactly like the title implies: You stir the ingredients together, then your pour them into a pan to bake. It is easier than making brownies from a box and it is HOMEMADE BREAD. It makes amazing bread without a mess, without kneading, and without blocking out a four-hour period of time. I am so amazed at this! Second, it only costs about $1.00 – for 100% whole grain bread with totally pure ingredients. Third, it’s homemade bread, which is obviously delicious so you should need no other reasons to make this, but I’ll give you some anyway. Fourth, anyone can make it. Anyone. Even me, while I’m having a conversation with someone. I know! Last weekend we had company. We all know I can’t talk and cook at the same time. I always have to either pick very easy meals to make for guests, or make most of the food ahead of time. Otherwise my talker and my thinker blow up all over the kitchen which results in burnt muffins, which doesn’t even matter because I have forgotten to put baking powder in them anyway. But last weekend, I made this Whole Wheat Stir-and-Pour Bread while having a conversation with my guests that actually made sense. This is monumental. A three year old can make it. Laura can make it while talking to guests in her kitchen. Not to take away from the three year old Cooking Guy, but you really must be impressed with this: Laura can make this bread at the very same time that she is telling a story to her out-of-town guests. You know this is a big deal. 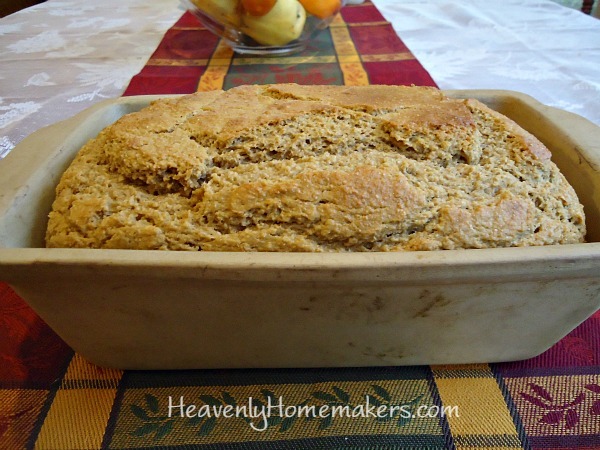 This recipe makes a great Whole Wheat Sandwich Bread. After I posted the recipe a couple weeks ago, many of you asked if it could be made into a bigger loaf for sandwiches. I decided to be nice and try it out. After all, I knew that if it didn’t work, I’d only be out about ten minutes of work time and I could use the results to make bread crumbs. It works, it works, it works! 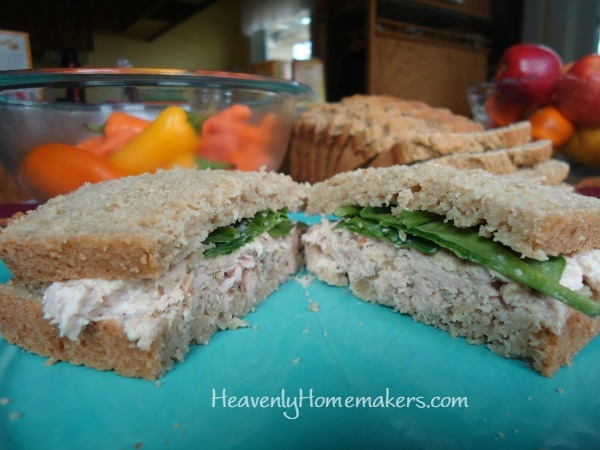 This recipe makes an amazing loaf of sandwich bread! You are going to love this! To go with this bread, I invite you to join us in enjoying Simple Meals week after week. It saves us all time, money, and energy so we can enjoy nourishing, delicious meals without sacrificing time with family! Butter your loaf pan well before pouring in the bread mixture. Bake it at 350° for 50-60 minutes. Let it sit in the loaf pan for about 15 minutes after it comes out of the oven. Remove it from the pan after 15 minutes. Allow it to cool completely before slicing. All of us love bread right out of the oven, right? I kept trying to slice this bread right away, which resulted in a very messy loaf. Delicious, but messy. When I let it cool before slicing, this bread becomes magic. It slices like magic. It tastes even better (I’m not sure how). And then it works wonderfully for sandwiches. As much as I love my old recipe for Honey Whole Wheat Bread, I will probably never make it again. Why would I, when the Stir-and-Pour Bread is just as delicious and forty times easier and faster? And it works better for sandwiches! Please try making this bread. I’ve said it before and I will say it again: this bread will change your life. I originally posted this recipe here, and I encourage you to read through it for more specifics. But I will post the recipe again with the details of making it into one sandwich loaf. This is my way of saying: GO MAKE THIS BREAD! ALL OF YOU! ANYONE CAN DO THIS! Cover and allow it to sit for 30 minutes. Pour contents into a well-buttered loaf pan. Bake in a 350° for 50-60 minutes or until evenly browned. Allow it to sit in the pan for 15 minutes. Remove the loaf to let it cool completely before slicing. Tell me if you’ve made this recipe already! Love it?? Go get out your mixing bowls. Your life is about to change. Don’t forget to check out Simple Meals. You are going to love this! Will this work if I use white flour? Thats all I have at the moment?? Great! I will be trying it this afternoon! If the 1/4 C cream is optional, is there anything we should/could use to substitute? For example if I only have fat free milk at the time, should I use that instead OR just leave it out entirely. Thanks!! Can’t wait to try this!! I have used whole milk yogurt and it has turned out perfectly. I made this with white flour, no cream, and it came out wonderful! I don’t think we have waited yet to let it cool :) I did find that I have to bake it less time – around 40 minutes otherwise it gets very dark with a very crispy crust. Maybe it’s just me but that is my experience using white flour. You said you used white flour, was it plain white flour or self-rising white flour, and if it was plain white flour do you have to use any baking powder or soda or does the yeast take care of that ? 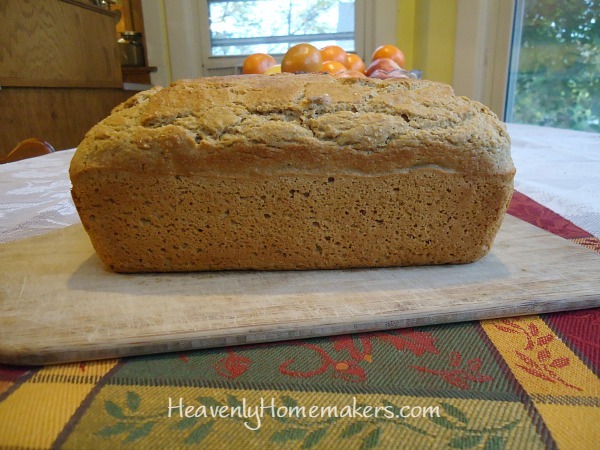 I have never made fresh bread before and I usually use self-rising flour….. If you could send me an email, I would appreciate it…..thanks Lindsey…. I use plain white unbleached flour and follow the recipe using an egg but no cream. You won’t need to add baking powder or soda – the yeast does the job :) I will say that I always “proof” the yeast by mixing the warm water, yeast, and sugar together and let it sit for 5 min or so to make sure it is good yeast and that I didn’t kill it with too hot water. It will start to get foamy on the top – that’s how you know it is good. And then you just mix everything together. I don’t have any heavy cream. I know it says options. Should I still add the egg? What purpose would the egg serve? You can leave out the egg and cream and be just fine. They simply add some fat to the mix which gives this bread just a little bit of a yummier taste. They also help keep the bread moist. Leaving them out will still give you a wonderful bread! Just curious if you’ve made this with out the egg and cream. If so, is there a difference in how it turns out? If you omit those, does it affect the moisture of the dough? The cream and egg add fat to make the bread more moist, but if you leave them out, this will still be a wonderful bread! I grind all my wheat flour on the same setting – straight up between “finer” and “courser” and on high speed. Have fun! Does this bread freeze well after baking? I want to use it for stuffing later on. I have yet to freeze this, but I would imagine it should freeze just fine! I have made this bread with the egg and cream and without them. The bread turned out good both times. I actually like it better without the egg and cream but I add 2 teaspoons of salt. I have been making no knead bread very similar to this for a year. I rarely buy store bread unless it is an emergency:) Now with this quicker version I shouldn’t need to buy bread:) I always freeze some of every loaf I make. I slice the bread first, lay the slices on a cookie sheet, freeze, and then put the slices in a bag. Yum! Yum! Who doesn’t love homemade bread! I’m glad to hear more salt worked for you. I thought it tasted like it needed more salt, but I didn’t know if adding more would mess up the yeast. I will add more the next batch! Could you tell me what size loaf pan you are using? Thanks for this great recipe – I can’t wait to try it! I am breastfeeding and wheat free at the moment to determine if my daughter my have a wheat intolerance, but I plan to make this the minute I can eat wheat. Thanks for sharing! I made this today with great results. Thank you! I’m going to make the kids French toast tomorrow. I never make French toast because I can’t keep up with bread as it is. Now it is no big deal to make more bread! If anyone has tried this einkorn, I’d love to know if it works. I’m gonna try it with Einkorn, I can’t eat the modern wheat. I would love to hear how the Einkhorn wheat bread turns out . . . and what kind of adjustments were needed! I can’t wait to try this! :) I love baking bread, but rarely have much time, so this will be perfect! Plus, we need sandwich bread . . . Could I sub half n half for the cream? Or should I just omit? Mitch isn’t as big of fan as whole wheat bread as me, so I want it to be as yummy as possible . . . Truly, either way it should be just fine. The cream (or half and half) just adds some fat to make this bread a little more moist. But some who’ve tried it have said they prefer it without. Okay, I haven’t finished a full cup of coffee, so sorry if my math is wrong. But…I usually make 4 loaves of your Honey Wheat bread every week. That takes me about 10 cups of flour (6 for initial soak, two added in after yeast/butter/salt, and then maybe 2 for the kneading). So for this new recipe, I would have to use 16 cups of flour every week! Is that right, or am I missing something (other than my caffeine fix!) I would love to make bread without the kneading, but that may be a bit much on my flour budget. Am I right on the math here? Looks like you’re right. I used to use 12-13 cups when I make a four-loaf batch and this would take 16 for four loaves. At this point in my life, it is worth it since my time is so very limited. But if you’re in a good rhythm of making the Honey Whole Wheat Bread each week and it’s working for you, you’d save some money by sticking with it! Hi Laura! What will happen to the kitties when they’re born? If you haven’t already considered taking Wiggams in to be spayed, please give it some thought. Unwanted kittens roaming the streets, like they used to in my small town in MN, is so SAD. And all those kitties will have kitties, and on and on. Also? Trying this bread today. Thank you! This arrived in my inbox just as I was going to look for your recipe to try it this morning. Thanks so much! I love making bread and am always up for a new way to do it. I have made this bread once and loved it! I made it in 3 tin cans, just for fun. The children liked the little round cuties. Don’t know if that was a healthy thing to do?!? Now I’ll make it into one loaf. Just used your new (ish) feature for save/print recipes. Awesome new feature–makes it so easy to add your recipes to my binder! I’m so excited to see this – I have a couple of questions before I attempt it. Would this work with gluten free flour blends? Would it work using flax goo as an egg sub? How about coconut milk instead of the dairy cream? Thanks in advance! I really don’t know as I have only made this with whole wheat flour. I’d skip the flax goo/egg sub entirely. Coconut milk has worked for others who’ve tried it! I have to tell you, I came to read about this bread, already having a favorite and easy bread recipe. But the COOKING GUY sold me–I shall make this bread tomorrow. Thank you for the recipe. Thank YOU, Cooking Guy, for your video. God bless. I tried this yesterday with GREAT success. So easy and yummy. I like the slight change of flavor and texture the egg and cream gave to the bread. If anyone is interested, I used coconut cream instead of dairy. Is there a difference between active live yeast and active dry yeast? Has anyone tried making this with sprouted flour? I’m curious if it would change the texture at all. I plan to try with sprouted flour, because that is all I use now. I sprout, dehydrate, and grind my own wheat. It is all very easy, once you invest in the equipment. I won’t be able to compare with un sprouted flour, but I will reply again with results. Kate, I was checking to see if you’d tried the sprouted flour yet I’d love to hear the outcome. I was wondering about using it with sprouted spelt flour. Did you try it? Did it work? Looks like a great recipe! Do you have bread pans you can recommend? I’m in the market for new ones for sandwich loaves as well as quick breads. Thanks! This turned out good. I used fresh ground hard white, the egg and I used some Greek yogurt thinned down with whole milk to the equal amount of the heavy cream. Mine baked fine in 50 mins. Thanks for the quick recipe. Would you mind showing a link to what yeast you use? I love your Wiggams updates, and this bread looks absolutely delicious! Maybe sometime you could give a sourdough (still 100% whole wheat,) version of it?? Trader Joe’s sold a good loaf of sourdough whole wheat bread, but it seems to be gone now. Thanks for the daily encouragement and recipes!! Does anyone who is doing the Trim Healthy Mama program use this? Or does anyone know if there a way to make it THM compliant? Sure would be nice. Do you know if RapidRise Instant Yeast (Fast Acting) is the same as active rise yeast? Instant yeast should not be the same thing. BUT you can use instant yeast where non-instant is called for — just not the other way around. The kind of pan in ur photo I have but have never used because I’m not sure how. I thought you didn’t butter those kinds of pans? Is that true? It is fine to butter stoneware. I’d butter it thoroughly for its first use to be sure the bread comes out easily. I made this using einkorn and it was great! You want to use about 1/3 less liquid since einkorn doesn’t absorb as well. I’ve also heard you can add a little coconut flour to the einkorn to absorb the wet ingredients better. Not much, maybe a teaspoon or 2? Haven’t tried that yet. It is true that anyone can make this bread! My nine-year-old daughter is now in charge of bread making which is AWESOME because she wants to help so bad and it frees up ten minutes of my day, lol! But really, the sense of accomplishment she gets is so amazing! Thanks again, Laura, for sharing this recipe. I had been just cutting the loaves in half and then putting them on their sides and slicing for sandwich bread but this sounds SO much easier, lol, plus one less dirty dish! Thanks again! Great to hear it is easy enough for a nine year old to make! My oldest is always looking for ways to help in the kitchen. Laura, I can’t wait to make this when my oven is fixed. I have yet to find a 100% whole wheat bread/roll recipe (sans added gluten) that doesn’t turn dry and crumbly after the first day. I normally use Trader Joe’s white whole wheat flour. Hopefully with the added egg and cream, this recipe will be the one. Also, how do you slice your bread so thin? I wait until it has cooled completely. Otherwise it doesn’t slice well at all! I made pour bread once, and it was incredibly crumby. Is this recipe crumby? We have found this bread to be quite moist! I was wondering if you could expand this recipe for the larger loaf pans, I have the 12 inch ones. I think you could probably use the same recipe in a 12 inch pan for a longer, thinner loaf. Or maybe try 1 1/2 times the original recipe? I made this bread on Saturday and found it to be a little dense. Is that normal? I guess I am use to store bought bread (organic, whole grain, but still . . .). Oh my goodness, this bread is RIDICULOUS. I will be making it a few times a week now. We have two dairy allergies in the house so I used coconut milk instead of cream and it was delicious. Since it’s so easy, I plan on experimenting. I want to make side-by-side comparison loaves, one regular, one gluten free (actually probably two gluten free, one with a gf flour blend and one with sorghum flour. Maybe even one with brown rice flour), and one adapted for soaking. I’ll also be making some to freeze, one I’ll freeze sliced and one whole. I will report back with my results! 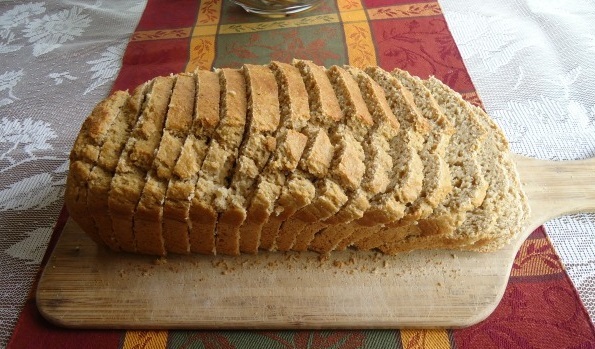 Audrey- Were you able to experiment with the GF version of this bread? I’ve been wondering about it too since I only cook with GF flour for our family due to some sensitivities. Thanks! Still working on it! Haven’t been able to experiment much lately but the holidays are over and we’ve almost recovered, so one more family birthday and one more Azure Standard order (I’m thinking sorghum flour would work well in this, but I’m currently out) and I will be able to play around more! I will definitely report back! I tried soaking as well, but it was pretty bad LOL. I’m going to try soaking one more time before I write it off completely though. Will definitely report back with results! This is definitely one of the best and easiest bread recipes I have ever tried. I used half wheat (a soft and hard wheat mixture my mom grinds) and half white and it came out great! I had let my mom borrow my loaf pans, I realized, so I put it in a small oval Le Creuset pan I had. It came out HUGE. Thank you SO much for this recipe! I’ve been wanting to make homemade bread for years! This sounds easy enough even for me! I am wondering if anyone has made this successfully as a gluten free bread and if so, what did you use as the flour substitute. Thank you. If you use the cream and egg which make approximately -1/2 cup of liquid do you decrease the 2 cups of water by that amount? I used my Bosch mixer to mix the dough but was not sure how long to mix it. My dough looked wetter than the video from cooking guy after I mixed it. Does the amount of time mixing it make a difference and could you also mix it by hand? Thanks Laura! Laura, you have literally changed my life!!! This bread is a gift from God sent through you to me???? I try to make as much as I can from scratch for my family, but we just bought our first house and moved all during our first full year of homeschooling and some days I wonder if I should feel so guilty about how long it’s been since I’ve grabbed the toilet brush let alone made from scratch meals for my family. My grandmother made homemade molasses oat bread every Saturday without fail until she literally couldn’t anymore and I always wanted to do the same for my family. Store bought white read I laugh in your face, ha! But then, I’m tired, I’m short on grocery money, and ya know I want to sit on the couch and rest my feet and brain for a few minutes instead of kneading bread. Anyway, this bread tastes amazing and takes no time at all. In fact my 8 year old is learning g the recipe and helping to make it so that he can take over the bread baking completely????. Thank you so much, my family and I are so grateful. Sorry about those question marks towards the end. They were from my 4 year old, in case you were confused???? Oopss …… Has anyone successfully made this using gluten free flour(s). Thank you. I’m sorry I didn’t try your stir-and-pour bread sooner. I was honestly put off by it looking too much like banana bread to even try it (yes, judging a book by it’s cover so to speak). I finally decided to make it yesterday and I’m smitten. I already had to brag to my sister and mom-in-law about how much they’ll love it and how easy it is. And it’s actually usable for sandwiches which is often a problem I find when I make bread at home. It seems the texture is usually a tick off for sandwiches. Well this recipe is a winner and I’m the fool for not making it sooner. Thank you for sharing and please forgive me for doubting. Love the recipe and can’t wait to try it. I only have metal or glass pans. Metal or glass will work just fine! I have never made homemade bread except for sour dough rolls….but can’t wait to try this recipe….need to buy some yeast when I go to the store….but for sure I will be making it and thanks for posting this Laura, it sounds so delicious……and I love the smell of fresh baking bread…..
Can you please tell me which size loaf pan you used to make this bread? I have 2 different sizes and don’t know which one to use. I made the stir-and-pour bread mix according to your directions, packed it into quart canning jars, and attached your free printable instructions, wrapped them in tissue paper, and handed them out as Christmas gifts to my coworkers. The compliments have been pouring in since I returned from Christmas break. I wanted to pass them along to you. Everyone glows as they tell me how easy it was to make the bread and how much their family loved it, usually with soup. Thanks for being such a blessing! I gave some of the bread in a jar gifts away for Christmas and my niece told me that she used half of her dough to make pizza crust and the rest for bread. I tried it today and it works great for pizza dough. It was a little sticky, but used a little extra flour and we loved it. We didn’t have pizza sauce on the pizza, so I’m not sure if it will get too mushy, but it was nice and crunchy with just cheese and other toppings. We just baked it part of the way before adding toppings. I tried making this home-made whole wheat bread and even though it tastes great, it is sticky inside…even on the day after. Is this normal or did I do something wrong? I mixed whole wheat and all purpose flour 1/2 and 1/2. Sounds like it needed a little more baking time. Try leaving it in the oven an additional 10 minutes next time to see if that helps! Hi, I am just trying my first bread and I’m literally scared..haha anyway I have few questions.. so you said eggs and cream are optional and that it will still turn out great even without them. But I don’t know if it will turn out moist without them..will it still be moist? Also, can I add like dried berries or oats in the dough? If I could, when should I add it? I haven’t tried adding oats or berries to this (great idea though! ), so since this is your first time making bread, I’d wait. But regarding the eggs and cream, this bread really is perfect without them, so leaving them out will be great. I never use those anymore in this recipe! Hello. Ive tried this already and really taste good but then I would like to ask that is it normal that the top of the loaf bread is kinda crunchy? By the way, I don’t have a sugar nor honey at the time that I made this. What I already have in my kitchen is maple syrup and yet, the bread still soft and yummy! HI. So I just made this bread and turned out horribly, as in must slather it with butter and then it somewhat ok to eat horribly. I trust your recipes because I’ve used recipes from you a number of times, so I am sure I did something wrong. I left out the egg and cream. I used coconut oil to grease he pan instead of butter because my daughter is dairy free. I used King Arthur whole grain whole wheat flour. Is the type of flour the issue? The bread had hard as a rock crust (which I figured was the coconut oil). But the inside was dense! Like have to gnaw to eat it dense! Any thoughts? I also used a kitchen aid to mix. Oh no!!!! After reading about your ingredients, which should have worked fine, I have no idea what might have gone wrong. Boo! LOVED IT! Best part my counter doesn’t get dirty, or more realistically, I didn’t have to clean it before making bread. I agree with a few other posts, it needs more salt, I’ve made it several times this wee and we love it but I use 2 tsp salt. I didn’t have half and half, so I replaced with whole milk, it still has the moistness (I omit the egg). I love how easy this recipe is, I can still make it at the end of the day when I realize, somehow all the bread has been eaten and there will be nothing for sandwiches tomorrow. LIFESAVOR. Just made this easy bread, tastes delicious! Just wondering if you always use your mixer? I made the bread using a small spoon( all that was avail at s cottage I was visiting. Will be making at home and wondered if it would be even better if I used my mixer. The family with the little boy in the video uses a mixer, but I don’t have one! I always stir it in a bowl with a spoon and call it good! First off, thank you for sharing this recipe. Second, I am one of the least domesticated women you will ever meet. So when I was giving about 20 cans of white and red wheat berries I had no idea what to do with them. Tried to donate them to charities but they all said no thanks. Then I saw this recipe and thought, why not. Got my Vitamix out (no other grinder available) and ground me some flour (something I never thought I would do in my life). Had to run to the store for yeast because mine was 10 years old but had everything else. My husband of 35 years rolled his eyes, my son just smiled and then checked the fridge to make sure there was a loaf of store bought. Gotta love them. Well guess what? Everyone loves it! I now make a loaf almost every other day and they even ask me which type of flour I am using because they know the difference between the white and red and what goes best with each (PPJ or Tuna). I have trouble getting this recipe to come out of the pan. I use a well greased glass pyrex loaf pan. I waited the 15 minutes. I was able to loosen the edges with difficulty, but not the bottom. I waited another 30 minutes or more and finally removed it but the bottom stuck and tore off. Any suggestions, anyone? Thanks! I’ve found the best success with stoneware. Glass works, but makes it harder to get the loaf out nicely. Beyond that, I can’t think why it’s tearing when it comes out!! Thank you! Since my last comment I have tried lining my pan with parchment paper and that worked. Thanks again! I am not into baking at all, but I am changing my diet and cutting out processed foods. So I was looking for a bread recipe when I came across this one. It was perfect for my level of baking aptitude! Today was the first time I made it, with whole wheat flour, honey, and buttermilk instead of the cream. It is delish! I can’t believe I made it. Now I can have toast without all the chemicals. Thank you so much!! I found the all Whole Wheat a bit heavy so I experimented and used 2 cups Whole Wheat and 2 cups sefl rising flour and what a difference. More of a light wheat. I also used Half-n-Half vs the Heavy Cream and Agave for the sweetner. Sure is a great recipe. Yesterday I did some more experiments and used 4 tablespoons of the Agave and 2 teaspoons of Cinnamon, then put in 1-1/2 cups dried Cranberries (Craisins) now you want to talk about some more good. Thank you for a great and easy recipe. Not only easy for a kid but, easy on a Husband also. Thanks to my Wonderful Wife for turning me on to this. I have tried your recipe two times. One with whole wheat flour, the other white. I wonder why both times the bread comes out so crumbly that it won’t even stay one piece. I like the simple method of making bread and I really don’t want to give up. Will you please email me and tell me what I did wrong? Thank you. Hi! Sorry for the delay on replying!! It’s hard for me to know what might have gone wrong without seeing the bread, but here are some ideas. I usually have to allow the bread to cool completely before I cut it, otherwise it falls apart. Also, I use freshly ground hard white wheat when I make this recipe, which always makes a lovely loaf. Store-bought wheat or white flour can turn out a different product. If using store bought whole wheat flour, I’d try to find a “white whole wheat” variety from King Arthur or Wheat Montana and maybe use just a bit less than the recipe calls for. Hope that helps! Third time making it today! The two first ones were perfect, we love this recipe!!! The third one might not be as perfect as the first ones, haha, I experimented a little to much with it I think ;) it goes into the oven in about 15 minutes.. hoping for edible results!! Could I put this mix into mini muffin pans to make mini rolls? how many do think it would make? So could I mabye half the recipe to make 24 mini? Or would that mess it up? I LOVE YOU!!! I’ve been avoiding making bread for years because I just don’t have the time but I certainly have the time to do this!!! Thank you so much for the recipe. I am definitely going to try this out! I am curious though, my husband and I are gluten-free and I’m wondering if you’ve tried this recipe with an all-purpose gluten-free flour mix?! I haven’t, but I think it’s worth a try! I have made this twice in three days! I used bread flour (until I get my own grain mill!!! ), did not use the egg or cream…it is fantastic! I can’t believe how easy it is and that we have finally found a good sandwich bread! My husband sliced it on our little meat slicer, so to get it sandwich bread-thin! Thank you so much for making my life easier and tastier! OMG, this recepie was fantastic. The process was super easy and it came out great. Thank you very much. I made this bread into a braided Hallah bread and it came out great! I used a mix of whole wheat and white flower and was surprised at how well the dough held together during the braiding. I did omit the cream, but the bread was soft and moist. Definitely will be making this again! Well, this bread certainly does rise well! Don’t make the mistake that I did – pouring it into a warm pan and THEN preheating my oven. The dough rose while the oven preheated (5-7 minutes) and then when I put it in the hot oven it OVER-rose and one side of the top of the loaf slid off! It made for some ugly bread, but it’s still really tasty! Next time I’m not going to pour the dough into the pan until the oven is preheated and ready! I just made this recipe and so amazed at how well it turned out. I printed the recipe for future use. I do not usually eat whole wheat bread……but this is very, very good. Thank you for sharing . I do end up wits a hard, thick crust. Tried less cooking time and center was undercooked. Any tips? So glad you love it so much! I’m a bit stumped on the crust. You can try leaving out the yogurt – I skip the cream now just for ease and it works great! Oh dear. Apparently not everyone can make this bread!! And I do have lots of experience making yeast knead bread! Haha! As I type this, I have 2 loaves in the oven, spilling over. I cleaned up the first run over, and put a pan with a silicone mat under it. Thanks! My Nutrimill I have wanted for years arrived today, and I am so excited! This bread has made my life easier. Thank you so much for sharing. I typically soak my bread, but have found that whipping this up in less than an hour is a better fit for my life with four kids right now. I can easily make a batch every few days and the kids love it. Good work! I’ve been trying to find the size of the larger loaf pan you talk about but can’t find the info in this article or the blog post. Is there a larger size pan than the standard 9×5? Omg! Thanks for making my life easier. I have made this bread maybe 10 times. I literally no longer buy bread at the store unless life interferes with my baking. I make it 1/2 whole wheat 1/2 bread flour and sometimes put in milk, not cream and less salt. Now for the real interesting thing. : gluten. I saw an article about why homemade bread often is crumbly or just does not stick together (which was my issue). Well, this article suggested wheat gluten, about 2 tsp to the loaf with a bit more water than you normally use. I did this today and it completely changed the bread. It still has the nice, crunchy top, but the crumb is much more consistent and sticks together, allowing you to use it to really make a sandwich. Wow it turned out great! Thanks for the great recipe! I used 2 cups each of fresh ground hard red and hard white. Delicious. So easy. I will make this often. We have eliminated as much processed food as possible and eat 80% plant based since my husband was diagnosed with Luekemia in March. This healthy loaf is wonderful and good for him! Made this bread again tonight and used 1/4 pumpkin puree in place of heavy cream. Husband says it is best yet! on the yeast: you have active rise yeast. Is that the same as rapid rise instant or active dry or what? What brand did you use? Active dry yeast has a larger granule and needs to be dissolved in water before using, while instant yeast has a more fine texture and can be mixed right into dry ingredients.